It’s time to welcome spring in your home and bust out those springtime decorations! You’re going to love all of these budget friendly farmhouse spring decorations! Spring is officially here (even if that weather isn’t feeling like spring quite yet)! Decorating for the seasons can sometimes seem like a hassle, but it doesn’t have to cost much or take a lot of time. Decorating for spring can simply mean adding some fresh or faux flowers or greenery here and there, adding a wreath to the front door or adding a cute spring sign to an empty wall. I’ve got you covered with some great spring decor ideas that are all budget friendly from Etsy! Don’t forget that you can print out your free farmhouse spring printable too! You can grab your free spring printable here! 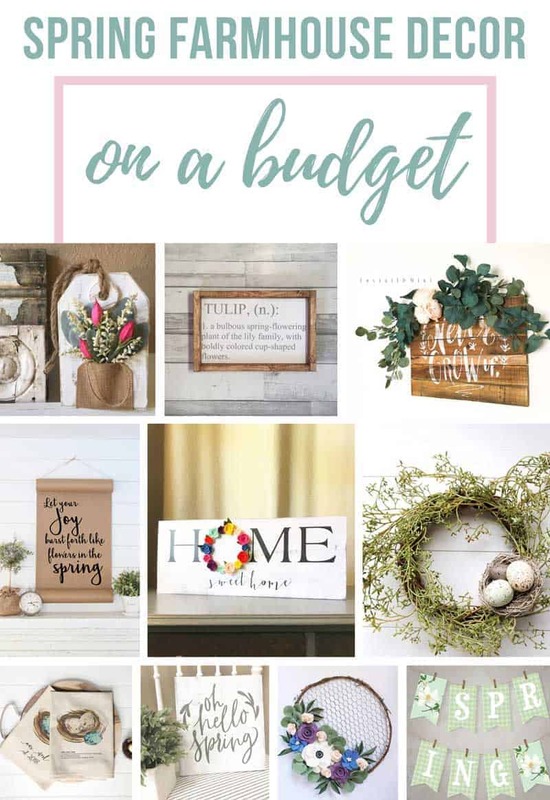 Are you ready to see these budget friendly farmhouse spring decorations?! How cute is this hanging wooden farmhouse tag distressed for an aged look, with an adorable quote that is perfect for springtime!? You can hang it on the wall with the thick jute rope or set it on a table or shelf! I love this adorable farmhouse sign in a neutral color scheme. Tulips are really the epitome of springtime, so this sign is just perfect for this time of year! Spring is definitely the time to add some extra flowers and greenery around your home. I’m loving this farmhouse boho teepee that’s made of silk flowers and cotton ribbon. Say hello to Spring with this cute paper scroll sign. It is the perfect touch to your farmhouse spring decorations! This home sweet home sign brings in all those spring vibes! The letters are painted in black and wreath is formed out of faux boxwood, which is just adorable! This would look cute in your home year round! Mini wreaths are a great addition to any decor. I love this mini spring wreath with a natural grapevine backing and a touch of rustic with green baby’s breath and 3 small eggs nestled into a tiny nest. it’s just the sweetest touch for Spring. Mini wreaths can be hung on coat racks, placed as an accent over signs or framed shiplap. This talented shop owner also made the directional coordinates sign seen in my farmhouse master bathroom. These tea towels are the perfect way to add a little touch of spring to your farmhouse kitchen. They also make a great bridal shower or wedding gift. You can customize the tea towel with “our nest” and your choice of year or just use the nest definition. So cute! Welcome spring into your home with this adorable hand painted sign. I love the colors and script used in this sign. I would really look adorable anywhere in the house mixed in with your spring decorations. You’ve gotta incorporate some colorful flowers into your spring decorations, even if they are felt ones! I love this 14″ chicken wire wreath is adorned with handmade felt flowers. It’s the perfect addition for that farmhouse look. 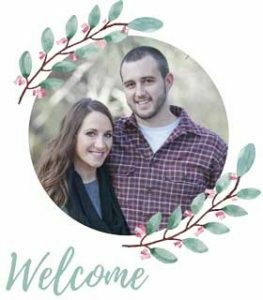 Welcome spring with this printable banner featuring magnolia illustrations and a gingham pattern. You can buy this in two sizes included for your convenience. Instant digital downloads are perfect for do-it-yourself (DIY) crafters and last-minute planners. It’s so freakin’ simple…All you do is print the banner, cut it out and hang! You can also print the banner as many as you many times you would like for your own use. Decorating for the seasons doesn’t have to be a hassle or cost a ton! Just incorporating one or two new items to give your house a little refresh for spring will add some fun to that decor! Any of these awesome spring decorations would be a great addition to your decor this season. Which of these farmhouse spring decorations is your favorite? ?